Scientists would love to study Evelyn Ralston, pepper her with questions about her lifestyle, take samples of her DNA. Not that their grand endeavors particularly concern the Evanston centenarian. Ralston would rather watch golf on television, nap in the afternoon and take daily walks outside her retirement home, a plush assisted living facility called Mather Place at The Georgian. "I'm not that interesting," said Ralston, alert and immaculately dressed on a recent afternoon. At 108 years old, Ralston is not only interesting to gerontologists, she belongs to a selective group of people who have lived more than a century. 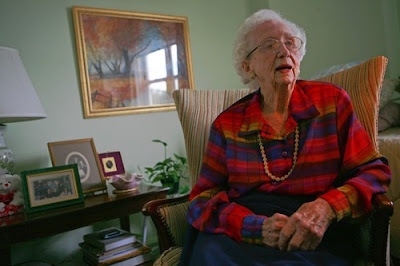 If she celebrates just two more birthdays, she'll enter an even more exclusive cohort of supercentenarians, people who have made it to 110, an age only 1 in nearly 6 million ever reaches. Ralston will turn 109 Oct. 17. Her thin frame and unruffled manner likely helped her live this long; scientists say people who live longer tend to be slim and less stressed about life's ups and downs. But those traits are secondary to the attribute that matters: good genes. "In order to make it past 100, you had to win the genetic lottery at birth," said Jay Olshansky, a professor of epidemiology at the University of Illinois at Chicago. Gerontologists are discovering that the secret to longevity lies not in a magical Fountain of Youth, but remains hidden—for now—along the intricate genetic sequencing in a person's DNA. The challenge is to map the genomes of the really old to find which gene mutations they have in common. "Something helps them get to old age," said Nir Barzilai, a professor of medicine at the Albert Einstein College of Medicine in New York, who has been studying centenarians since 1998. "We're trying to identify the genetic elements that help protect them." So far, he has discovered four genes that he says appear important to longevity: two are related to good cholesterol; one exists in fat—and the less fat the better; the fourth gene delays growth. The study of the very old has made other gains in recent years, gerontologists said. Part of the reason is that there are more centenarians than ever before due to medical breakthroughs that reduced child mortality rates, deaths from infectious diseases, and the number of women dying during childbirth. Luck plays a factor too. "You have to avoid getting run over by a bus," Olshansky said. "Then you have the opportunity to express the longevity potential you were born with." Thomas Perls, director of the New England Supercentenarian Study and a geriatrician at Boston Medical Center, has found people older than 100 tend to be a diverse group—they may have had heart attacks or smoked or were overweight for part of their lives, and yet something compelled them to live a century. But after 110, that heterogeneity ceases, he said. He has mapped the DNA of some 80 people over 110 and found they were more genetically homogenous. He hopes that similarity will make it easier to isolate the variations that helped them live so long. "With [homogeneity] comes a much better chance of discovering some of these genetic variations," Perls said. In about a year, Ralston would be eligible to participate in Perls' study. Ralston has a baptismal certificate and a passport to prove her age—but verifying even that fact has proved difficult for scientists studying extreme age. Few places at the turn of the 19th century issued birth certificates. Births, if they were noted at all, were registered in church logs. Many people, gerontologists said, exaggerate their age or don't really know it. The lack of documentation makes keeping statistics difficult. Data from the Illinois Department of Public Health, for instance, showed a little more than 2,000 people were ages 100 to 104 in 2000, the most recent statistic available. The stats logged 59 as more than 110 years old. Gerontologists said those numbers are likely bloated. Regardless, Ralston plans a quiet celebration with little fanfare. If prompted, she'll recount her family's first car, bought in 1926, and the time she drove it off the family farm to help her brothers steer cattle to market. She remembers her first trip to Europe after she got her passport at age 72. Besides, as birthdays go, she doesn't see what is the big deal. "I'm not that old," she said. "A lot of people are older than me."